Barbeque a turkey dinner in 3 simple steps! Fire up the barbeque! Invite some friends! July is prime patio party and grilling season! We Canadians need to soak up summer weather while we can! And when it’s warm and sunny outside, you don’t want to be stuck cooking inside. So keep it simple: fire up the barbeque and make your whole meal on the grill, starting with turkey. A barbequed turkey dinner is an easy way to prepare a mouth-wateringly good meal while you visit with your guests. Plus, turkey is a healthy choice to build your meal around – it’s lean, packed with protein and filled with health-boosting nutrients like vitamin B12, iron and zinc. Step 1: Grill your turkey. 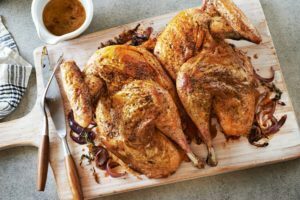 A whole turkey is a smart choice for the barbeque – not only is it a delicious, nutrient-rich choice, but it goes a long way to feed a crowd and there’s something for everyone! In my house, my hubby loves turkey legs, I’m a breast gal and my two teenage sons happily eat any cut, so we’re all satisfied when we grill a turkey. How do you cook a turkey on the grill? Start by lightly brushing your turkey with canola oil and rubbing on your favourite seasonings, like onion powder, garlic powder, salt and pepper. You can barbeque a turkey on the rotisserie or in a roasting pan. Or, do what I always do: I spatchcock (flatten) my turkey for full-on flavour and even cooking. Plus it’s quicker too! Is a whole turkey too big for your barbeque? 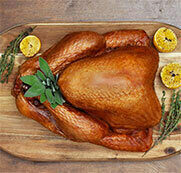 Try this scrumptious Sweet and Spicy Half Turkey – just ask your butcher or grocer to cut a turkey in half. Cook one half now and freeze the other half for another time. And if you prefer turkey cuts, try grilled turkey steaks, breasts, drumsticks, or thighs. Canadian Turkey features a bunch of tasty grilling recipes for all the cuts. Ask your butcher or grocer for available turkey cuts and if they’ll spatchcock a turkey for you too! Hot tip! Turkey is lean (both white and dark meat!) and so there’s less fat to drip onto the barbeque causing flare-ups. Even still, it’s better to cook your turkey over indirect heat. I like to add a small pan with stock that I re-fill to help keep the turkey moist too. Step 2: Grill some potatoes. To keep it simple, I grill whole potatoes. They are the BEST with a drizzle of roasted garlic oil! Just wash and prick whole potatoes with a fork, rub them with canola oil and sprinkle with coarse salt. Wrap with foil and place on the grill when there’s about an hour of turkey cooking time left. Tasty tip! To make roasted garlic oil, wrap a whole head of garlic in foil and place on the grill until the garlic is soft. Mash the peeled cloves with a bit of salt. Add olive oil and whisk until mostly smooth with some tasty garlic-y bits. Step 3: Grill a bunch of veggies. Pretty much any vegetable can go on the grill: zucchini, asparagus, broccoli, cauliflower, red pepper, onion, corn on the cob. You name it! And they all pair perfectly with turkey. Before my guests arrive, I chop up my veggies, marinade them in lemon garlic vinaigrette, and stick them in the fridge. When we’re just about ready to eat, while the turkey is resting, I toss the veggies into a grilling basket and pop it onto the barbeque! It takes about five minutes. Easy peasy! Cook once, eat twice: grill enough turkey, potatoes and veggies so you can have extras to make a super salad – like this Turkey Nicoise Salad – for lunch or dinner the next day! Yep, even dessert can be done on the barbeque! Just brush fresh fruit like peach halves, pineapple rings or plum halves with canola oil – it’s neutral tasting and can withstand the higher heat of a barbeque. Place fruit on the grill until it’s warmed and slightly softened. Serve with creamy vanilla Greek yogurt or a small scoop of ice cream. Next time you’re planning your patio party, make it easy: start with Canadian Turkey.